"I know that now I'm going to have to work for Alberto (Contador), but that's something that motivates me a lot. I consider it a great responsibility to work for a great leader like him." Jarlinson Pantano was one of the revelations of the 2016 season and he will try to confirm his results in 2017. As a winner of the 15th stage of the Tour de France in Culoz ahead of Rafal Majka, the Colombian has indicated that he has the potential to join the likes of Nairo Quintana, Rigoberto Uran and Esteban Chaves as elite climbers from the South American country. In 2017, Trek-Segafredo managed to win the battle for the 28-year-old Colombian's signature after he was forced to leave IAM Cycling which folded at the end of the year. The negotiations nevertheless began before the announcement of the decision by the Swiss team and Pantano was already prepared to support Bauke Mollema at that time. The plans have changed in the meantime and it is now Alberto Contador that the Colombian will have to support. "At Trek-Segafredo, my role will undergo a big change," he tells Ciclo21 in a lengthy interview. "I know that now I'm going to have to work for Alberto (Contador), but that's something that motivates me a lot. I consider it a great responsibility to work for a great leader like him." As lieutenant, Pantano hopes to learn and gain experience, well aware that in a year or two he will maybe get his own chance to lead the team at a Grand Tour. Meanwhile, the goal in 2017 will be to win the Tour with Contador and in addition Chris Froome, Pantano points to his compatriot Nairo Quintana as a great rival. He thinks that it can be the year of Quintana and he is certain that one of his compatriots will soon win the Grande Boucle. "I think the question is not whether a Colombian will win the Tour but when one of us will do," he says. "Quintana showed that he is able to do it, Chaves has also proved that he was very strong ... I cannot say when it will happen because Chris Froome is a rider who only prepares to win the Tour and has demonstrated that he is able to win it easily. I am sure this will happen in the future." Of course, Pantano dreams of winning the Tour and even be the first in his country to do so but he is aiming for a more reasonable goal for the future. "I dream of being on the podium of the Tour but I have to move slowly." The 19th place finisher of the last Tour de France promises that the Colombians "will become completely crazy" when a Colombian victory has been achieved. 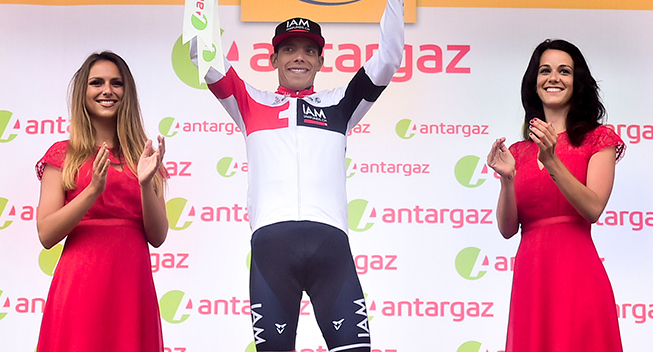 This year, Pantano hopes to build on his momentum and prove himself as Alberto Contador's team-mate. He also wants to have opportunities at the Tour de Suisse - where he took his first WorldTour victory by winning the last stage in 2016 - and why not at the Vuelta? If he continues to progress as fast as he did last year, he could quickly assume a leading position in a WorldTour team and try to realize his dreams at the Tour de France.